There’s a little town about 25 miles from me that is associated with a rather delicious tart. The town is Ecclefechan (pronounced Ekkle-FECKan) and in many ways it is really very unremarkable as a town, yet they seem to have this brilliant culinary, history! I’m not sure if I use the “traditional” recipe or not, but I don’t care because whatever it is, I make it’s really good. You’ll need to start by blind baking a pastry case, and you might have to doctor the filling to fit whatever size of pastry case you have blind baked. Melt the butter and then combine everything pour it all into the pastry case and bake for 30 mins. Serve hot or cold with ice-cream, double cream, whipped cream… Enjoy! In March Bloggers around the world are looking for “British” recipes, and this is defiantly one of those! 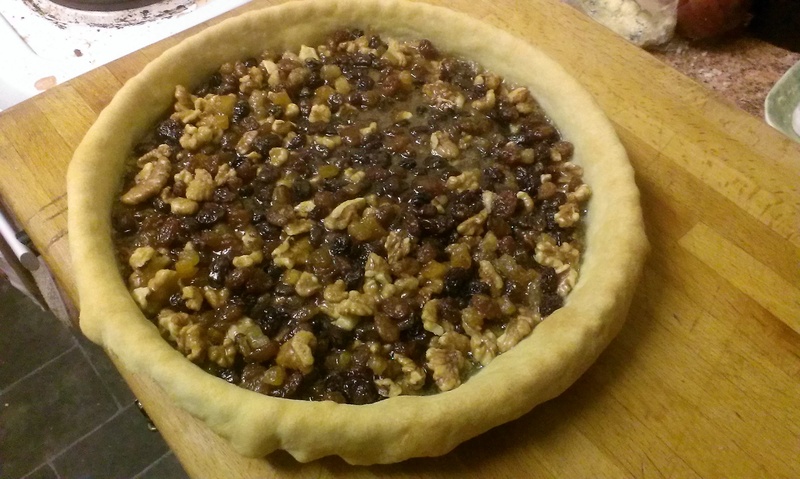 This entry was posted in Cooking and tagged cooking, eating, food, pudding, recipe, scotland, tart. Bookmark the permalink. The tart sounds lovely. Thank you for joining us on our food travels. It looks lovely and reminds me of a huge mince pie! yum! must admit it was a mention of Ecclefechan that made me stop 🙂 thanks for sharing.